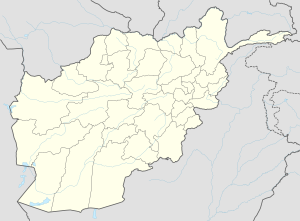 Zhari (Pashto : ژېړۍ, Persian: ولسوالی ژری‎) is a new district in Kandahar Province, Afghanistan. Alternate spellings include Zheley (due to transliteration from Pashto), Zharey, Zharay, Zheri, or Zheray. The district was created from territories taken from Maywand and Panjwai districts. The population is estimated at 80,700 (2010). Zhari is located on the north bank of the Arghandab River that runs east to west through Kandahar Province. The general area is sometimes referred to as the Arghandab Valley. The built-up and farmed area of Zhari is approximately 30 km east to west by 8 km north to south between the Arghandab and Highway 1. Most buildings are single story mud structures, with narrow, winding roads and walkways. The exceptions are the grape-drying huts that are larger buildings as high as 20m, and which are scattered throughout the countryside. Grapes, opium poppies and cannabis (for hashish) are the most common crops. The farmlands are irrigated by a complex system of wadis running parallel with the Arghandab. The area north of Highway 1 is more desert-like with abrupt mountain ranges of approximately 200-400m in height. The Shurah is the basic mechanism of government in Zhari. The tribal nature of the district is inseparable from politics, making the decision-making process difficult and time-consuming. The Zhari District Center, the seat of government for the district, is located near the Pasab Bazaar near Pasab, Zhari. The district center is also adjacent to Forward Operating Base (FOB) Pasab, a former Coalition Forces base now controlled by the Afghan National Security Forces. Jamal Agha is the district governor of Zhari as of 28 March 2015. Muhammed Naez Sarhadi and Karim Jan were previous district governors. Mohammad Masoum Khan leads the Afghan National Police forces in the district as of 26 January 2015. Most people in Zhari are ethnic Pashtuns. There are no less than a dozen tribes, the most prevalent of which are the Alizai, Achakzai, Noorzai and Ghilzai. There are many nomadic tribes that also pass through the northern areas of Zhari between Maywand and Arghandab districts. NATO and ISAF continue their efforts to support the Karzai government and quell an insurgency. The Taliban is deeply rooted in Zhari's history and attempt to exert influence through a system of mullahs and elders (see Resurgence of Taliban). The situation is complicated by the warlords and criminals who also attempt to minimize the government's power in the area to further their own ends. A 2 am raid on 18 October 2006 by NATO helicopters, hunting Taliban fighters, was only half a mile from the scene of September's 2006 Operation Medusa, one of the most ferocious battles between Western forces and insurgents since the ouster of the Taliban regime in 2001. On 4 October 2013, 4 U.S. Special Operations soldiers were killed and 12 wounded during an operation in the Zhari District. The coalition soldiers were killed by a set of IEDs and a suicide bomber. A Taliban spokesman claims explosives were placed in a house and detonated when soldiers entered. As other soldiers entered to assist the fallen, a suicide bomber detonated his explosives. ^ "General visits 3rd BCT Soldiers during Pasab Day". The Mountaineer Online. Fort Drum - United States Army. Retrieved 5 February 2015. ^ "US troops in Afghanistan: Packing up and moving out". Global Post. Global Post. Retrieved 5 February 2015. ^ a b "Afghanistan launches poppy eradication campaign in former Taliban stronghold" 27 January 2015 accessed 27 July 2016. ^ "Poppies destroyed on 400 hectares of land in Kandahar" 28 March 2015 accessed 27 July 2016. ^ "DVIDS: Cleaning House" 29 May 2012 accessed 05 February 2015. ^ Chandrasekaran, Rajiv (2013). Little America : the war within the war for Afghanistan. London: Bloomsbury. p. 281. ISBN 1408831201. ^ "Western Zhari: the people, leaders, tribes and the economy." [Kandahar? ]: Human Terrain Team AF8, 2010. ^ "Civilians reported killed by airstrikes as NATO hunts Taliban" 19 October 2006 Archived 10 March 2007 at the Wayback Machine accessed 19 October 2006. ^ "Bomb Kills 4 Soldiers In Afghanistan" 6 October 2013 accessed 6 October 2013. This page was last edited on 24 February 2018, at 08:26 (UTC).